We won`t be able to cancel order that already processed. Headset only (as shown in the picture). You will get item as it is depict in the picture. Sony MDR-Z7 Ultimate High-Resolution Stereo Audiophile Closed Back Dynamic Headphones w/70mm Drivers MDRZ7. S ony MDR-Z7 Ultimate Hi-Res Headphones utilize never-before-experienced headphone technology (including powerful 70 mm drivers) to provide you with the best possible sound quality. Cord type: Detachable Y-type. We are very accommodating and will be more than happy to fix any problem. ==============. Sony MDR-Z7 Headphones. ATTENTION READ DESCRIPTION!!! No CABLES INCLUDED!!! Sony MDR-Z7 Headphones - Black. Condition is Used. S hown CABLES in pictures areNOT INCLUDED. 4.5 out of 5 stars - Sony MDR-Z7 Headphones. ATTENTION READ DESCRIPTION!!! No CABLES INCLUDED!!! 8 product ratings8 product ratings - Sony MDR-Z7 Headphones. ATTENTION READ DESCRIPTION!!! No CABLES INCLUDED!!! Sony MDR-Z7 Headphones. - Sony Carry Case. Aux cable NOT included and will be needed for function. Photos show the exact unit you'll be receiving and the exact contents you'll be receiving. Sony MDR-Z7 Headphones - Black. Condition is Used. Shipped with USPS Priority Mail. In great condition, no signs of wear, includes packaging and original cables. Tested and works flawlessly. We are not experts in any given field. We want you to be confident when purchasing. Sony MDR-Z7M2 Hi-Res Stereo Overhead Headphones. CableLength: Headphone cable (Approx. 118 1/8 in (3 m), silver-coated OFC strands, Gold-plated stereo mini plug), Balanced-connection headphone cable (Approx. ). PROFESSIONALY USED & MAINTAINED, PERFECT WORKING ORDER. 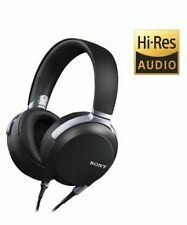 Sony MDR-Z7 High-Resolution Stereo Audiophile Closed Back Dynamic Headphones from japan [Very good] #406726A. There are not any big dents and scratches at the body. Optical system. I will look it for you. Capture videos far and near with the Carl Zeiss 12x optical zoom lens. The focus, zoom, and iris ring will give you the clearest picture posible. You will receive all the parts seen in the photos. MAGNET Neodymium. So you can hear all the emotion and energy of the original recording with punchy bass and crystal clear high notes. Does Not Apply Features: Stereo. Accessories: Unimatch Plug Adaptor, Headphone cable (3 m), Balanced-connection headphone cable ( 2 m), manual (Japanese). This pre-owned Sony HVR-Z7U is in very good condition. If you have any issues let us know. Hours are 41 X 10H Operation; 27 X 10H Drum Run; 22 X 10H Tape Run; and 64 X 10 Threading. 1/60 - 1/2000. Manual shutter speed Auto. Auto, one-push auto (A/B positions), indoor (3200 K), outdoor (selectable level -7 to 7, approx. 500K/step), manual WB Temp (selectable 2300K to 15000K, 100K/step). Sony MDR-Z7M2 High Resolution Dynamic Headphone. Equipped with an HD driver unit that realizes 100 kHz playback. It is a stereo headphone that you can experience the natural sound like listening to live music by making the wavefront of the sound wider and flat. Sony MDR-Z7 Audiophile Closed Back Dynamic Headphones from japan [Very good] #421970A. There are not any big dents and scratches at the body. Optical system. I will look it for you. Condition looks perfect. Sony HVR-Z7U Camcorder. We do our best to notate each flaw. This refurbished unit has been thoroughly inspected, repaired and tested by our in-house, factory-trained technicians. You can expect a fully-functional unit. Operation: 136 x 10, Drum: 67 x 10, Tape: 48 x 10, Threading: 131 x 10. Sony HVR-Z7U MiniDV Camcorder. Sony XLR Microphone. All components have been tested and are in perfect working order. All pictures are of the actual item being sold. Structure Sealed. Sensitivity 98db Maximum Input Power 2000mW. Fit Design Over Head. Frequency Response 4Hz�`100kHz Impedance 56ƒ¶. But rarely unexpected stuff. We promise to work hard on. Condition New Unopened. Trending at $619.92eBay determines this price through a machine learned model of the product's sale prices within the last 90 days.